Delivery was great, not used yet but have had great reviews from friends. Will use Tayna again. 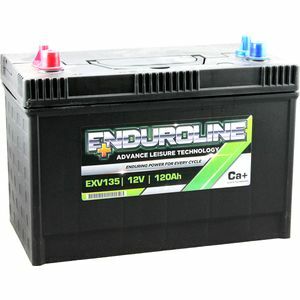 Top quality battery at a superb price and delivered next day. What more could you ask for. Batterie commandée le vendredi à 17h00 et livrée d'Angleterre le lundi suivant 11h30 à Bordeaux. Système de livraison extraordinaire. Qualité du produit: excellent. Je recommande vivement ce fournisseur. Just started using this battery. It is a good compact size by length and width but fairly tall which exactly suited the space I had - the smallest 120 AHr I could find with good quality. It is a decent weight so hopefully of good quality and it's backed by a 4 year guarantee. Price was also the best I could find and it came well packed with a decent level of charge and clear instructions on the removal of transport plugs. I purchased this battery to replace an old one in my motorhome. Fantastic power used it for five days with hardly any power loss. It coped with all our needs including showers every day. Worth every penny I spent. I can now plan longer trips and not worry about my power supply ???? Delivery and product exactly as detailed on the website. Perfect for my needs. Whilst necessarily heavy as all leisure deep cycle batteries are, I have used the battery 3 times to power my new Minn Kota Engine. I have juice left after a days fishing on a relatively small still water . This gives me confidence that there will still be power in the battery left on a larger reservoir. Very battery and excellent service. I have never used this company before but read the reviews online. part from one moaning one to which the company had replied I decided to purchase 4 batteries from them. All I can say is "Great" service from original order placement to even the delivery driver calling me to tell me he was here when he couldn't make anyone hear his knocking. Excellent battery, just what I wanted. Carefully packed -& backup service for queries was excellent too. Sadly, there were NO details of the delivery firm at all & -even more sadly- they lost it . This led to some worry (& considerable inconvenience) here. When I could contact you again, you eventually sorted all this out -the carriers had stored it in a warehouse instead of delivering- & it was, after all, only a few days late. Just what I wanted, very fast delivery. Spot on.